cloudHQ is a unique service that, while not free, offers a very useful service. 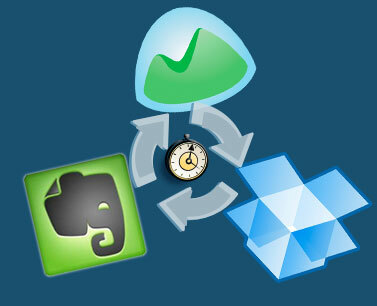 It allows you to backup and sync files between Google Drive, Dropbox, Sugarsync, Box, Basecamp, and Evernote. You can sync your notes and files between Basecamp, Dropbox and Evernote, back up your cloud data, and even synchronize docs and notes between Google Drive and Evernote in real time. cloudHQ continuously syncs all of your files between your different cloud services in real-time. This is very useful for backup and security, along with making files more accessible to others who need to use them, and even turning your Evernote notes into collaborative Docs in Google Drive. The personal plan is $4.90 per month, or $49 per year. There are also premium and enterprise accounts for higher fees, with more features. While not free, this could be a very useful service for many people who use a variety of cloud services. Google Docs is excellent for collaboration. Evernote is perfect for note taking, web clips, etc. Sync all your Evernote notes and Google Docs documents. So all your Evernote notes can be Google Docs and all your Google Docs documents can be in Evernote. It really simplified everything - because you can start something as a note and migrate into Google Docs for collaboration. Or you can think about this setup as a backup: Google Docs is backup of Evernote and Evernote is backup of Google Docs. Disclosure: I was not compensated in any way for this post. I just feel that this could be a useful tool for many people.